After 50 years since its original introduction, the FIAT 124 Spider is coming back! It gives iconic Italian style with a modern adaptation. It is the most affordable turbo-powered convertible in American starting at $24,995 MSRP. It includes features that give it enhanced driving dynamics like a double-wishbone front suspension, balanced weight distribution, and a tuned electric-power steering. It is loaded with amazing technology with Keyless Enter 'n Go, heated seats, Bose nine-speaker audio system, and Bluetooth connectivity. Explore all the features available and included with the all-new 2017 FIAT 124 Spider! The engine behind the 124 Spider is a turbocharged 1.4-liter four-cylinder engine. It produces 160 horsepower and 184 pound-feet of torque in the Classica and Lusso. The Abarth trim bumps up the torque to 164 horsepower. It comes with rear-wheel drive and the option of a six-speed manual transmission or six-speed automatic. The manual transmission offers 30 mpg combined with 26 mpg in the city and 35 mpg on the highway. The automatic transmission offers 29 mpg combined with 25 mpg in the city and 36 mpg highway. The handling and control comes from the double wishbone front suspension and multilink rear suspension. These features give perfect road handling and stability with sharp response on turns. The electric power assist system makes the roadster's steering responsive. The maximum speed with the FIAT 124 Spider is 215 mph. The 124 Spider is a roadster with two seats that comes in three different trims: Classica, Lusso, and Abarth. The Classica offers a manually retractable black soft top with a glass rear window, air-conditioning, LED taillights, push-button ignition, a leather-wrapped steering wheel and shift knob, cruise control, power accessories, Bluetooth, a six-speaker sound system, and a 3-inch display screen. The Technology package available comes with keyless push-button entry, HD radio, an additional USB port, a rearview camera, and a 7-inch touchscreen. The Lusso offers automatic headlights, bright exhaust tips, foglights, automatic climate control, automatic wipers, heated seats, 17-inch wheels, leather upholstery, and the Technology. The Abarth offers all the features above plus a limited-slip rear differential, quad exhaust tips, a sport-tuned suspension, full leather or leather/simulated suede upholstery, Brembo performance brakes and adjustable driving modes. There is a limited-edition trim called the Prima Edizione that is based on the Lusso and is limited to 124 models. It features the special blue Azzurro Italia paint, a numbered production plaque, and a two-tone interior. What is included in the Safety and Comfort package? This package comes with auto-dimming mirrors, a blind-spot monitor with rear cross-traffic, rear parking sensors, and heated exterior mirrors. Do you have any Used Coupes? The trunk size measures at 4.9 cubic feet. The 124 Spider is made with high resistance aluminum and steel to increase the rigidity of the body. These materials were used to absorb the shock in the case of an accident. The chassis is made with a special rear traction and engine in the front. The safety features that come standard are antilock brakes, stability and traction control, and side airbags. All the trims come with a rearview camera, while some advanced features can be added to the Lusso and Abarth with the Safety and Comfort package. 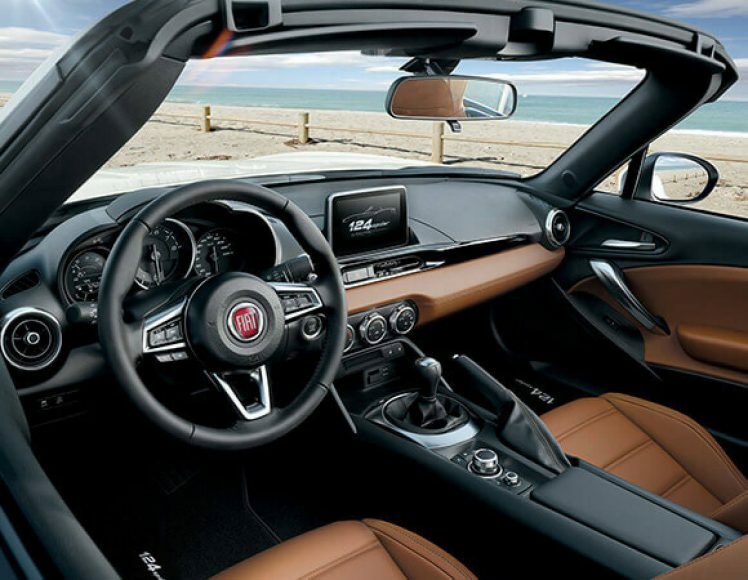 You should fill out the form below to find out more about the FIAT 124 Spider!